OK, so it’s Monday evening and I’ve just about recovered from an exhausting weekend filled with summer fêtes. ‘What on earth could be so tiring about that?’ I hear you ask, with thinly-disguised incredulity. Well, Saturday saw me manfully (or should that be womanfully?) helping out at the Moo’s school’s Right Royal Summer Fayre. A good time was had by all, and lots of money was raised for the school, but 09:00-17:00 is a long day when you’re running about trying to find someone to man the hook-a-duck, and worrying about who’ll take over on splat the rat! Sunday saw me take a busman’s holiday at the Sutton Poyntz Victorian Street Fayre, an extremely well-organised, professional village fête. Tons of stalls, and more tombolas than you can shake a stick at. We came home with lots of teddies (because we really need more teddies! ), plus plants for the garden, and two posies in sweet, white jugs (except my dad dropped one of the jugs by mistake, grrr). 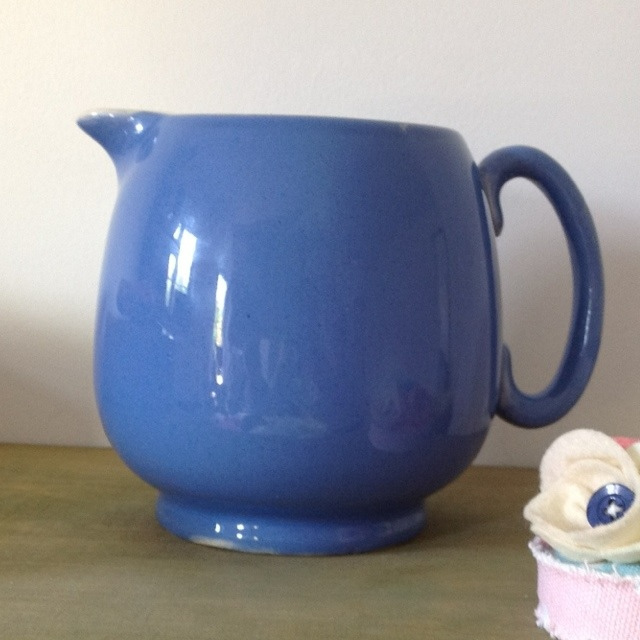 I then had to buy a replacement jug and found this blue beauty on a charity stall. And for only £1, what could be better? In the evening we drove out to Portland to find the Big Red Ball, which has been in Weymouth for a few days as part of the build-up to the Olympics (we’re hosting the sailing events here). And find it we did, stuffed in next to the Cove House Inn. Fun! Making-wise, I completed the first (of five!) projects for the handmade heart swap. I really must crack on with the next, or my swap partner will demand that I get swapped!